The event_route is offering a framework for developers to give script writers more control when special events happen. Unlike the other routing blocks which were designed to process SIP messages, the event_route can be triggered by a non-SIP-related event as well. An example is event_route[htable:mod-init] which is executed by htable module when it is initialized. Practically, the event_route is executed once, when Kamailio (OpenSER) starts. The main goal for event_route[htable:mod-init] is to allow initializations at startup -- can be variables from htable or other modules. Next episode to be about: topology hiding module. R-URI or routing headers might have domain names and the DNS resolver is hidden behind functions like t_relay() or forward(). Moreover, there is pretty quite complexity in selecting the next hop by strict or loose routing, outbound proxy address and R-URI address which tied with DNS failover made the options to get the destination address in config impossible with older versions. you get access to all attributes of destination address: address family, transport protocol, ip address and port. $snd(name), where 'name' can be 'ip', 'af', 'port' or 'proto'- get access via PV to destination's ip address, address family, port or transport protocol. In addition to details of destination address, when name is 'buf' or 'len' you get access to content of output buffer and its length. Not all functions exported by core or modules are available in onsend_route, however, you can drop the request, access message flags, use transformations over the output buffer and more. msg:len keyword returns the length of the message to be sent, not the length of original message. Alex Balashov of Evariste Systems, active community member and contributor of Kamailio (OpenSER), running a VoIP consultancy business in USA, leads a VoIP User Conference about Kamailio, the role of Asterisk, SER and media gateways, etc. Evariste Systems comes with a big bag of expertise about SIP and SIP Proxy, Kamailio (OpenSER) in particular, being one of the nominations for Kamailio (OpenSER) 2008 Awards and good candidate for 2009. The most important change, comparing to Kamailio (OpenSER) 1.5.x (or older), in regard to TLS is a new internal architecture - the core is no longer dependent of SSL libraries. If in older versions, enabling TLS means to recompile everything, with TLS=1 flag for Makefile, in Kamailio (OpenSER) 3.0.0 TLS implementation is provided by a module, named tls. Coming as well with support for server name extension, another feature that worth to mention is the option for a dedicated config file for TLS parameters. Moreover, the new architecture offers far better performances, as it is reusing lot of TCP enhancements, getting to tens of thousands TLS connections in a single SIP server is easier than ever. Note that TLS was not updated to work in asynchronous mode, therefore when using TLS configure TCP in non-asynchronous mode (feature planned for next major release). Next in this series: onsend_route. 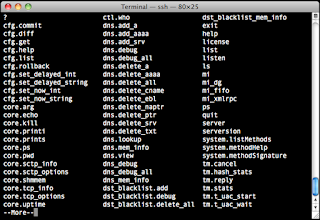 Along with Kamailio (OpenSER) 3.0.0 you will get a command line interface: sercmd. Installed on same directory as kamailio binary, sercmd enables admins to connect to running instance of Kamailio, either on same or remote system. If you use default configuration in the ctl module and sercmd, with kamailio on the same system, then just launch sercmd. 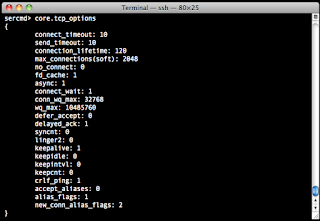 Next post to be about asynchronous tcp. Inherited from SIP Express Router (SER) via sip-router.org project, the cfg variables framework can be used by Kamailio 3.0.0 core and by the modules, to get and set internal variables on-the-fly, eliminating Kamailio restarts whenever it is possible. Such variables can be global or module parameters. The operations with cfg variables can be done at any time without performance overhead. The framework makes sure that the variables do not change during the SIP message processing, the child processes see a snapshot of the variables with constant values. The variable that is changed will be automatically replaced by the framework the next time a SIP message is started to be processed. The drivers can change the values of all the variables by names with or without the need of commit. That means a kind of transaction support, the framework can keep track of the changes (per driver) until they are committed or rolled-back. gateway.destination = "127.0.0.1" descr "IP addr of the gateway"
gateway.enabled = 1 descr "enable/disable the gateway"
The cfg variables can be changed via control interface (e.g., xmlrpc) or using the new command line interface application (cli): sercmd. Next episode will be about sercmd. That could make the big configs hard to understand after a while, when was need for troubleshooting or enhancements. It was a nightmare to check what route was intended to do when you encountered the execution of it in another route. Previously, many people, including myself, used a text preprocessor like M4 to have string IDs for route names, but with some disadvantages: more files to manage (at least two m4 and one cfg), you had to edit all the time the m4 file, compile it with m4 in cfg, then the errors were reported by Kamailio relative to cfg file, resulting in mismatch of error's line number and the place you had to edit for fix. However, the new embedded features with string names for routing blocks eliminates the restriction of up to 60 (40 in older versions) route blocks where the IDs must be in between 1 and 59. Instead of static array, the routing blocks are now in a hash table, allowing as many routing blocks as you need, with no constraints in naming. The default configuration for Kamailio 3.0.0 uses this new feature: see it online . Next writing will be about new config parameters framework. For more examples, see Kamailio 3.0.0 default config file - authentication, NAT traversal, presence functionality, ... can be enabled or disabled via #!define. Next to write about is route blocks with names. I'm starting a series of posts, to highlight the best new features in Kamailio (OpenSER) 3.0.0, of course, from my point of view, hoping to cover most of them before full 3.0.0 is out (RC3 was done yesterday). Note that you can use include_file anywhere in your config file - included file must contain valid config statements for the part where is included (e.g., global parameters, modules loading, module parameters, routing actions, etc.). Next is going to be about #!define support, which completes perfectly the include_file feature to ease the maintenance, troubleshooting and development of config files. Lot of fixes to packaging, code and documentation have been committed since RC1, Kamailio 3.0.0-RC3 becoming ready for pre-production phase. Feel free to contribute to wiki pages, helping to build migration tutorials. This is the last RC before full 3.0.0 relase. Please report any issue you find to sr-dev at lists.sip-router.org. Note that new tarballs are generated only if there are changes for the corresponding branch (so if you don’t see a tarball with today’s date it means there was no change from the previous one). The tarballs are generated via make tar, which makes sure the correct repository version will be included in the compiled binary (make tar generates first autover.h before creating the archive).